I’ve been up against a deadline to get as much of the urgent heavier jobs done before Thursday, when I went into the local hospital to have a hernia repaired. I’m now walking around rather gingerly, with instructions not to do too much at all physically, for the next three weeks or so. It was heavy sneezing that did it: during a succession of bellowing, snorting “aitchoos” something strangely went “bloop” in my groin. It was quickly obvious what it was and, thankfully, the excellent health service here allowed me to see my doctor, have a scan, see a surgeon and be booked in for repair in double quick time. In fact, I even had to ask to have the op later than I was first offered, so I could host a volunteer for a week, take our three pigs to the abattoir and a couple of other urgent smallholding jobs before my obligatory R ’n’ R.
As Gabrielle headed for the ferry to go and support her mother through her second cataract operation, I drove to the local railway station to collect volunteer Tom, a furniture building, computer programming Englishman in Paris. I think we pretty much did something different every day. 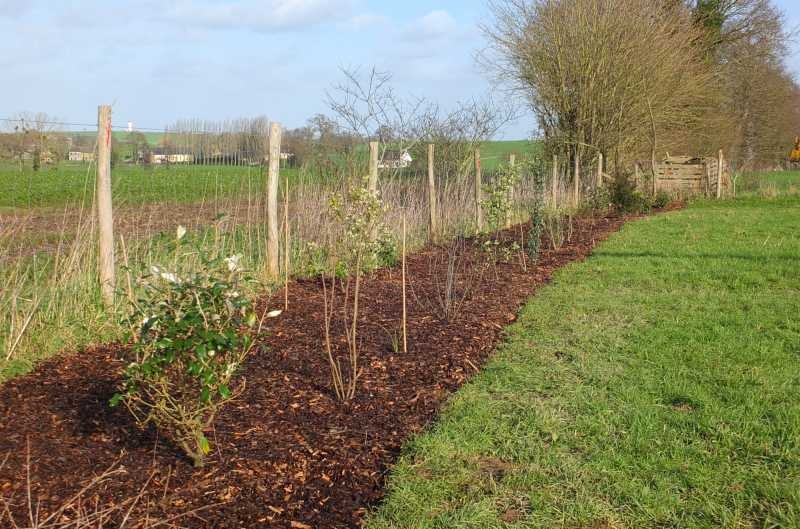 We attacked a brambly jungle in our woodland, creating a path around the edge of a third-of-an-acre plot where we want to set up a coppicing cycle (more on this in future blogs). Continuing work I’d already started, we mattock-ed off a two metre wide band of turf, prepared holes and planted a double row of trees and shrubs that will serve as a windbreak to our developing forest garden. We also spent a day beating an overgrown laurel hedge into submission at the house of our vet. Another of our exchanges, we “pay” for any veterinary treatment to our animals through gardening jobs. We were helped by the jovial, energetic and elderly Francis Gallée. At 86, his appetite for life and work outdoors is undimmed and he took all the brash to the nearby municipal tip, saving the larger trunks for himself for heating wood. 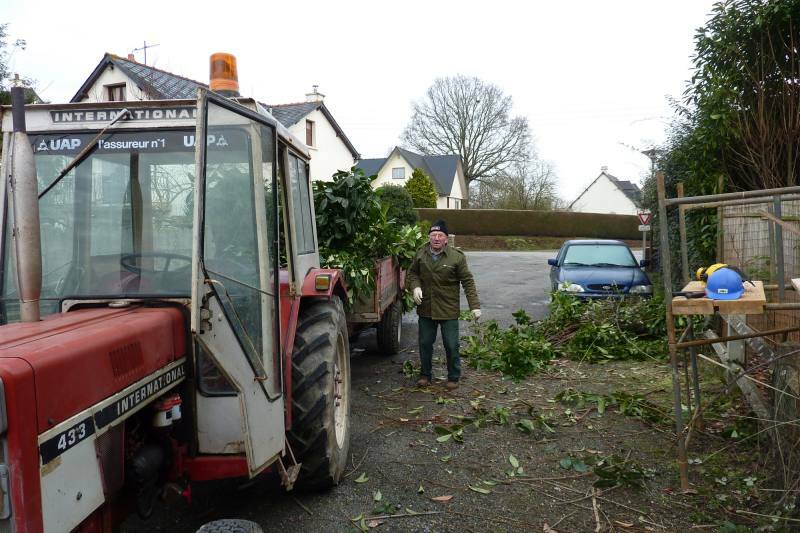 Smiling proudly, he told us that he’d bought his tractor new … over thirty years ago. 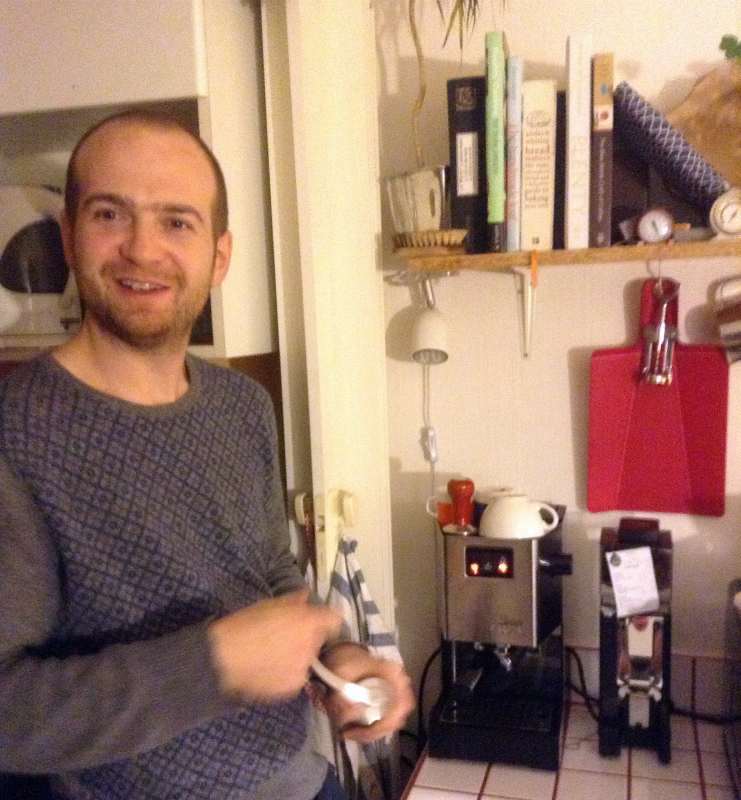 Tom introduced me to the pleasures of freshly-ground coffee. He brought with him a Japanese Porlex hand grinder and a packet of beans and we finished each breakfast with a small cup of black coffee, drunk with the care and enthusiasm of a connoisseur. We ate well, grateful that Gabrielle had frozen a store of home-cooked food before she left. One more job I had lined up was the taking of one of last year’s lamb for the freezer. I put this to Tom, saying that I could easily wait until after his departure as I didn’t want to push him into something that he would feel uncomfortable about. He had a think and said yes. Following a thorough explanation of what I was going to do, the animal was humanely slaughtered (using a captive bolt stunner) skinned and drawn. It was then wrapped in a clean sheet, hung overnight in our workshop and butchered the following morning. I devilled the kidneys (with a few added mushrooms to bulk it out) for lunch the following day and Tom said, “I felt it was one of the most direct relationships I've ever had to my food.” After a half-day’s work on Sunday, Tom's last day on the smallholding, we treated ourselves to a traditional Sunday roast, with a very fresh leg of lamb, roast potatoes, boiled cabbage (out of the garden) with loads of gravy. 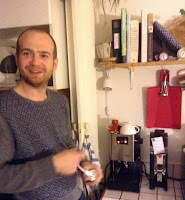 As Tom had introduced me to the finer points of coffee appreciation, I felt I ought to return the favour (flavour?) by opening a good bottle of Bordeaux, which we sniffed, swirled and sipped before gulping ... absolutely delicious!